CREATe is the RCUK Centre for Copyright and New Business Models in the Creative Economy, based at the University of Glasgow. It is a pioneering interdisciplinary initiative, and globally the first effort to investigate the relationship between Creativity, Regulation, Enterprise and Technology (=CREATe) through the lens of copyright law. The Centre brings together an interdisciplinary team of academics from law, economics, management, computer science, sociology, psychology, ethnography and critical studies within a consortium of seven UK universities (Glasgow, East Anglia, Edinburgh, Goldsmiths University of London, Nottingham, St Andrews, and Strathclyde), and over 80 industry, public sector and civil society partners. 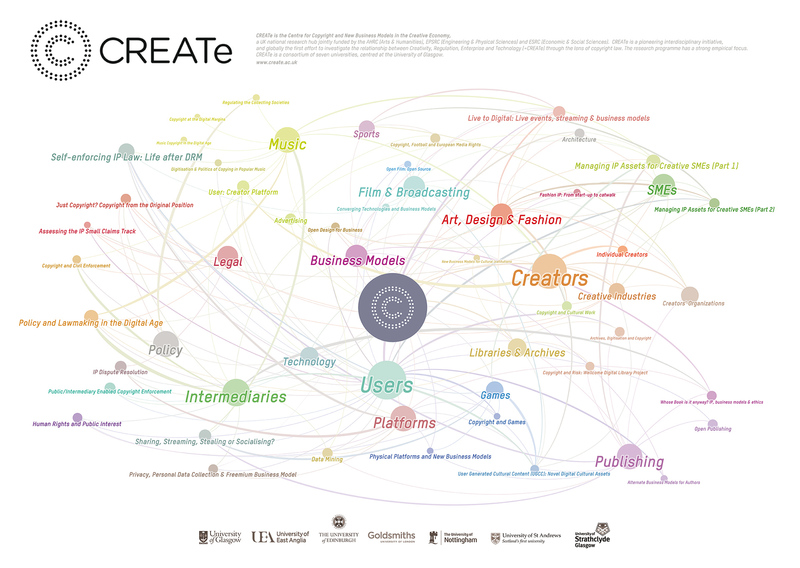 Working closely together with CREATe researchers Kris Erickson and Andrew McHugh, we have produced a network graphic illustrating connections between the many individual projects carried out by the CREATe research consortium. The CREATe team validated the information gathered from the Intranet, and the first version of the graph was produced using the open-source software Gephi. 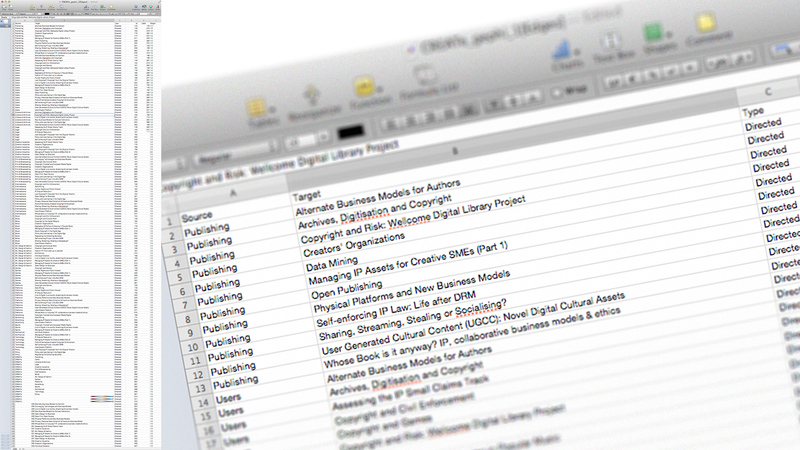 Nodes represent the work packages carried out as part of the 4-year RCUK funded project to study copyright’s role in the creative industries. Edges denote shared methodologies, approaches and themes. Using Adobe Illustrator, we polished the graph and created a visually attractive and accessible version of the network.